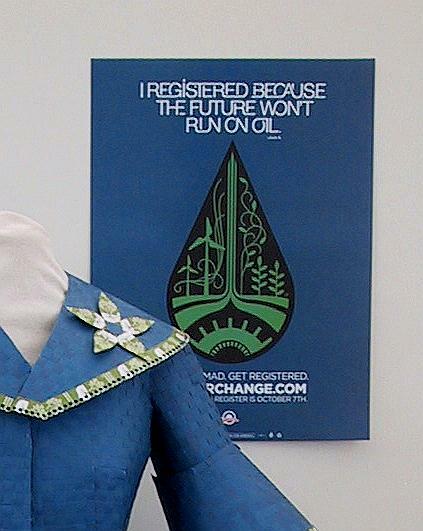 When people ask me what I do, I tell them I am an artist and an environmental advocate. I also tell them that I am a Teaching Artist. And it has never been truer than this year as I am spening so much time diving into the classroom. I just finished an artist residency at one school, I am in the middle of another, I am preparing for a Skype presentation with a classroom in Ireland, and I am planning half a dozen other workshops and camps for this spring and summer! Though I have been in classrooms and working with children for over 25 years, in the last 2 years I have been training to be a Teaching Artist with an organization in Portland called the Right Brain Initiative. How is a Teaching Artist different than an Art Teacher, you might be wondering? 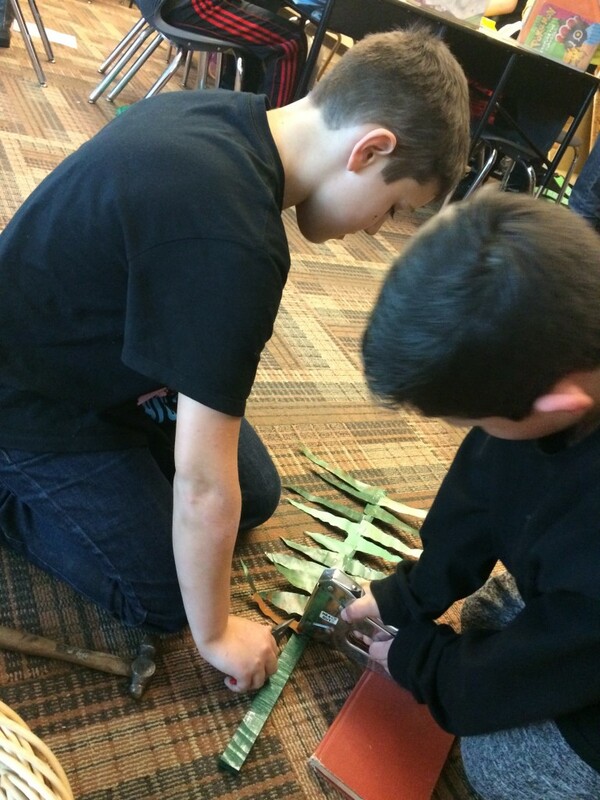 As Teaching Artists we are trained to provide an Arts Integration experience to students. The John F. Kennedy Center for the Performing Arts in Washington, D.C., one of the leading organizations that has researched and taught Arts Integration, defines it as “an approach to teaching in which students construct and demonstrate understanding through an art form. 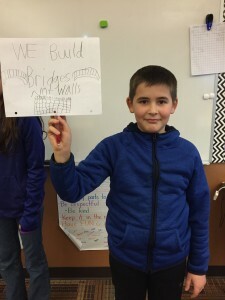 Students engage in a creative process which connects an art form and another subject and meets evolving objectives.” Or in my words, we develop creative experiences to help students understand academic subjects such as math, science, social studies, history, reading, or writing. My first Right Brain Initiative residency last year was with two 3rd grade classrooms at Quatama Elementary School west of Portland Oregon. The students had just studied the life-cycle of salmon and were working on fractions. I started my time with them by having small groups use a creative movement activity to act-out each stage in a salmon’s life-cycle from little eggs, to swimming out to sea, to coming back and laying eggs. Next we used plastic, something that fish mistake for food when littered in waterways and oceans, to create a collage of a Salmon. We used fractions to determine where on the body the fins should go. You can see in the photo below that the students were also asked to write specifically what stage of life their Salmon was in, and what it was doing. 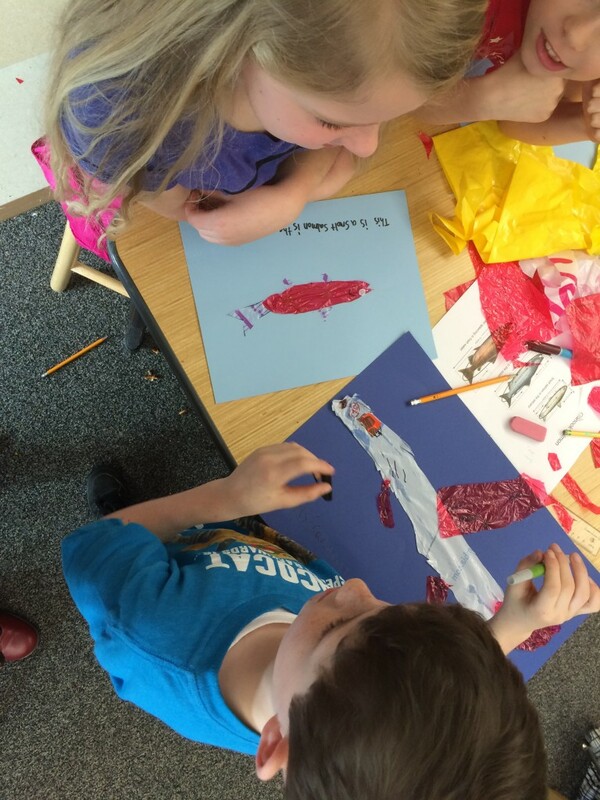 Thus theater, visual, and literary arts were used to “construct and demonstrate understanding” of what they were learning about salmon. I recently finished a MUCH LARGER residency at Verne Duncan Elementary school just south of Portland. Here I worked with all of the 3rd, 4th and 5th grade classes (11 class rooms) and I visited each class 4 times, for a total of 44 sessions! 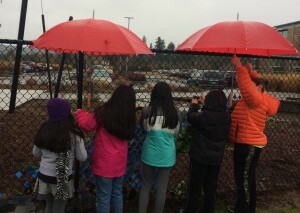 When the school initially contacted me they asked if I could create a mural with their students on a chain-link fence using upcycled materials. Knowing that I usually create “trashions”, they were not sure I would be interested but since I am always up for a new challenge, I said I would be happy to step outside my usually art form and try something new. I then had a meeting with the principal and the 11 teachers whose classes I’d be working with, where we co-created the content of the mural and residency. The theme was a natural habitat in the North West that included geological and weather/climate features, in addition to a river, plants, and planets. Each classroom contributed an element of the mural related to specifically what they were studying. On my first day, besides showing photos of my work and talking about my career as an artist, as might be expected, I also shared my challenges as a student with the learning disability, dyslexia. I often try to tell my story of overcoming my learning disability because, in addition to giving hope to students that face similar challenges, it supports general concepts that most schools are trying to teach such as perseverance and “growth mind-set”. Plus, I think the lessons I learned from my dyslexia have contributed to my ability to face the challenges of being an entrepreneur and have actually enhanced my creativity! If this is true, I want to share this inspiration with them! Question – Which will hold paint and stand up to the elements better, aluminum or plastic? Experiment – Cut pieces of an aluminum can and from a plastic detergent bottle; paint them with an outdoor acrylic paint; bury them in the snow for a couple of days; and then submerge them in water for 24 hours. Observe/Analyze – The paint scratched off the plastic, but not the aluminum. Conclusions – The aluminum will hold paint better, and over time will not become brittle and break down as plastic does. (I decided to use the conclusion I arrived at to also teach about plastic pollution. As an aside I asked, “Did you know that plastic never decomposes? It just breaks down into tiny little pieces that pollute the soil and water– so all the plastic that has ever been made still exists!) I certainly did not want this mural becoming a source of litter and pollution! A dedicated parent (Krisen, who’s children were not even part of my residency) cut the tops and bottoms off around soda 500 cans! The students sanded the strips of aluminum, painted them and using normal scissors cut them into different shapes. At this point some of the classes poked holes in the corners and ventured out into the rain (and snow!) to attach the pieces onto the fence. 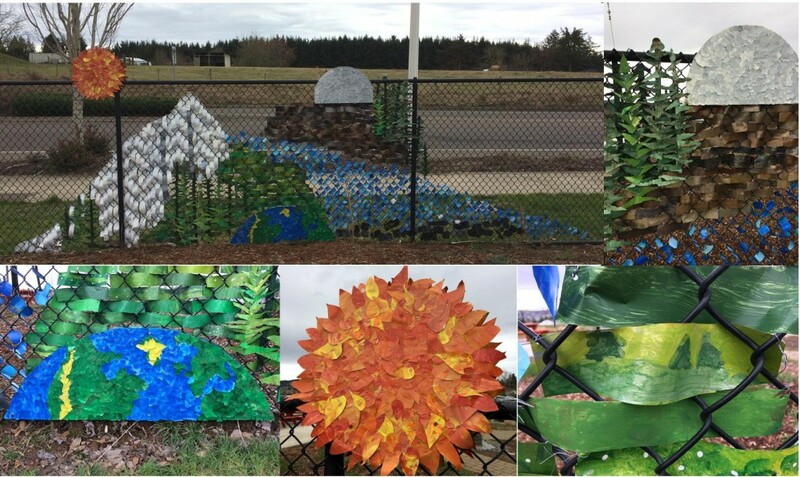 The other lucky students got to stay warm inside and staple their painted aluminum pieces onto pieces of wood that were transformed into trees, the earth, the sun and the moon which would later be attached to the fence. During each session we explored one line from the quote in-depth. On the last day I told the students a story about Chief Seattle that many people do not know. Even though the City was named after him, Chief Seattle was never allowed to live in the city limits. This was an opportunity to discuss the concept of discrimination, and link it to words the kids are familiar with like “bullying”. We also connected this to the idea of social INTERDEPENDENCE. Show how the trees in the mural are dependent upon the sun and river. Show ways of caring for the earth by acting out conservation actions like turning off the water and lights, or recycling and not littering. Show students helping each other. Show students demonstrating about an issue they care about such as equality or clean water. Show students writing and calling their leaders about issues important to them. 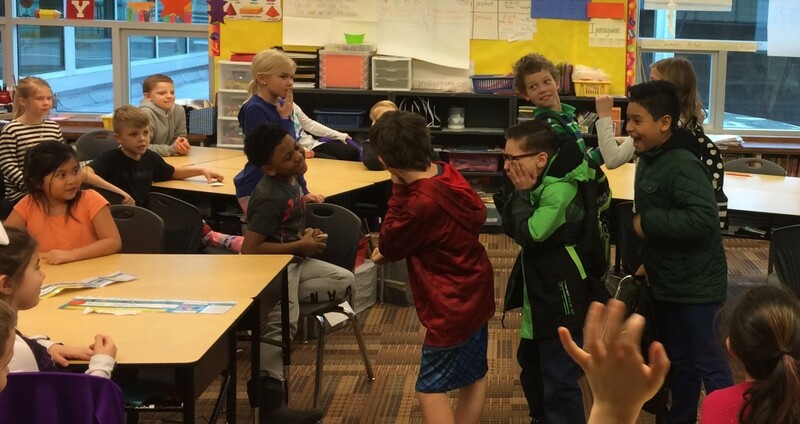 After each Tableau, the other students that were watching got to guess what theme was being represented and the students in the tableau would explain how their scenario connected to the Big Idea of INTERDEPENDENCE. In the last part of my session with the students, I took a bit of a risk and tied these ideas to the politics of the day. Specifically discussing the different forms of discrimination we see our federal government taking against Muslims and immigrants, and the power that is being taken from the Environmental Protection Agency to protect our air, water, soil and climate. Like a broken record, I kept returning to the idea that: “If we take care of the earth, the earth will take care of us, and if we take care of each other then we will be taken care of too.” I talked to the students about the power they have to model caring for the planet, and other people. I also told them that they can be powerful young activists standing up for the issues that they believe in. I was not sure how the school and the teachers would feel about my brining these current issues into the classroom. However, I am deeply concerned about how the new administration is impacting the planet and my fellow human beings and, because these issues are so related to the idea of INTERDEPENDENCE, I felt like I needed to make these environmental and social justice connections. The feedback I received from the teachers afterwards was positive and they said that they appreciated that I brought up what is happening politically because they felt like they could not. Also they liked that I focused on facts, not my personal opinions. I really enjoyed all aspects of this residency, and will miss the students, teachers and staff at Verne Duncan, it was an honor to be part of their community for a couple of months! My current residency at Hollydale Elementary school just east of Portland is focusing on making “trashion costumes” and connecting this to the Big Idea of cycles. Specifically, we are comparing the sustainable cycles we see in nature with the unsustainable cycles of consumerism specifically the fashion industry. If you are a teacher, school administrator, or parent please know that I would love to visit your children’s school too! As mentioned I even give Skype presentations to classrooms across the country and world! Contact me at Nancy@RecycleRunway.com if you would like more information. I am blown away by this post, Nancy. The amount of information you provide to the kiddos in so many fun, interesting and important ways is just amazing. Once again, I am awed by your gift to us all. Those of us who read your blog get a taste of what the kids learn in your classes. I’m so grateful you share this with us.